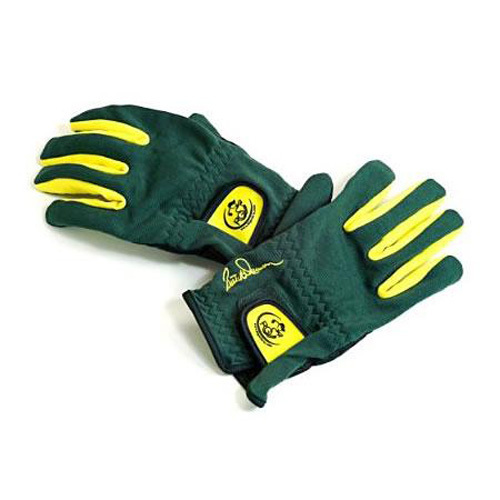 With the Right Grip Golf Gloves you can practice while you play. You'll get instant feedback on the proper grip pressure. With the correct grip pressure, you'll hit it longer and straighter, with every club in your bag. How do you use the Right Grip Gloves? 1. 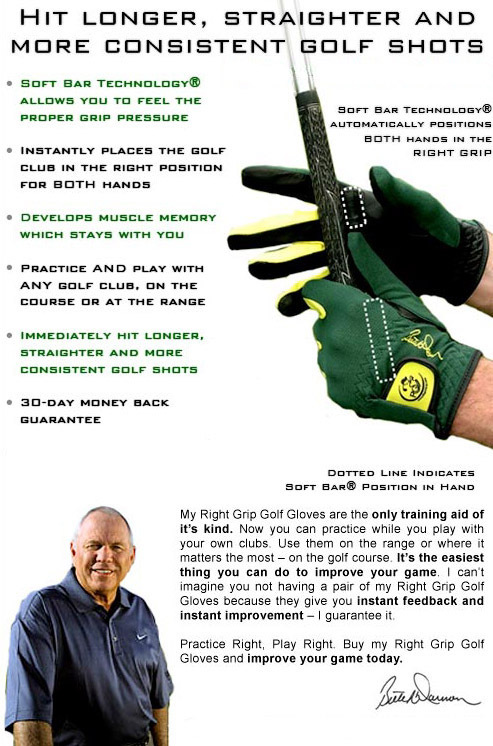 Put on both Butch Harmon Right Grip Golf Gloves as you would with ordinary golf gloves. 2. Hold your left hand palm up and lay the grip of your club across your fingers. 3. Gently close your left hand around the grip making sure the Soft Bar is on top of your grip. This will place the grip of the club in your fingers. 4. Hold your right hand palm up and lay the grip of the club across your fingers. 5. Gently close your right hand around the grip making sure the Soft Bar of the right hand is also on top of the grip. Both hands will now gently ccradle the grip with the Right Grip. You are now ready to experience longer, straighter and more consistent golf shots. It is that simple. Note: Some of the images shown above have white dotted lines superimposed over them to indicate where the Soft Bars should be positioned in relationship to the hands and golf club.